There he was, about to unveil a sizable chunk of Beyond: Two Souls in front of a packed house at the prestigious Tribeca Film Festival. This was only the second time that a video game was shown at the annual celebration of cinema founded by Robert DeNiro. (Rockstar showed L.A. Noire at the festival a few years ago.) So, yes, it was a big deal. Over the next half-hour, gameplay footage—it wasn’t clear whether this was being played live or was pre-recorded—showed a segment of the game where Beyond heroine Jodie Holmes was living on the street. After a grim sequence where she stumbles around in a blizzard and passes out, Jodie wakes up in an abandoned warehouse after being rescued by a homeless man. You can see what happens in the entire 35-minute preview from Tribeca below. I'll list some highlights if you don’t watch the whole thing. Early on, an emotionally spent Jodie tries to kill herself. Aiden—the disembodied essence that players can control and that Jodie communicates with—stops her. Later on, Jodie begs for change and gets harassed by a jerk on the street who offers to give her $10 “to go ‘round back.” After her first day on the street comes to an end, she meets Tuesday, a pregnant woman squatting with the other homeless people in the warehouse. Tuesday hadn't felt baby kick in days but Jodie assured her—with some help from Aiden, it seemed—that the baby was still alive. And, just before the climax of the demo that was shown, Jodie helps deliver that baby. Begging for spare change. Delivering babies. These are not the kinds of things that you do in most big-budget video games. On one hand, it seems like Beyond is telling a somewhat conventional genre fiction story about a young girl with special talents who winds up working for the military. Those are tropes we’ve seen before. The chunk of Beyond shown at the screening did have combat sequences, dialogue decisions, environmental puzzle-solving and other elements that feel typical to, say, a Halo or Uncharted title. But that just makes the more realistic elements stand out more. “I was interested in putting you in the shoes of someone living in the streets,” Cage told me. “This is something that some films have done before but very few games try that. I think it’s important to do it in games because you actually can experience much more of what it means, because it’s you, you’re in control and you lead that. We just saw one walk-thru, one possibility, but there are many ways you can play this scene and see different aspects of living in the street." I asked Cage if he had any concerns about portraying people who are achingly poor and on the fringes of society. Did he worry about any kind of backlash? “These are not the kind of questions that I ask myself when I write,” he answered. “I write things that move me. You don’t even have the choice of what you’re writing. You write what you need to write.” So why did he need to write that scene? "I was interested in putting you in the shoes of someone living in the streets." "You try to create a very unique moment, something that will be strong and emotional and moving." When Cage made his comments about turning off the console, I wondered about the next game machine coming from Sony. Beyond: Two Souls is the kind of game where, at some point. you’re going to have plot twists that players may want to share with each other. Like, here’s what I did, “I actually jumped off the bridge and Jodi’s dead.” Or, “Or I didn’t save Jimmy, he burnt to death.” I asked Cage he was worried about what a share button could do, in terms of how it could affect the uniqueness of the experiences for the player. Would he want to turn that function off or have it not to be shareable? Would something like the PS4’s share button change how he and his Quantic Dream peers design their games? 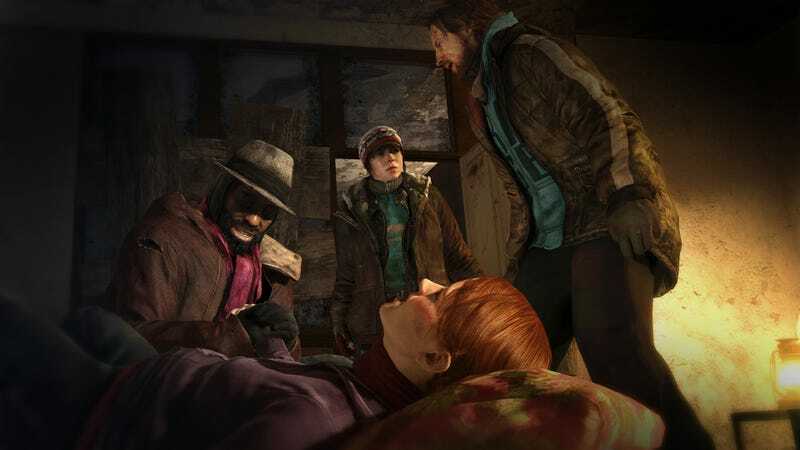 "There will be quite an important gap between what we are showing here on Beyond and what is really possible sometime soon on Playstation 4..."
Update: An earlier version of this article had the title "You're Going to Deliver a Baby—And Attempt Suicide—in This PS3 Game. In order to better serve those readers who don't want to know anything that happens in Beyond, that title has since been changed.